In a lifetime of working in and observing cities throughout the world, I’ve noticed that late-nineteenth century neighborhoods are amongst the last to be regenerated. This is due in part to the resilient endurance of their economic and social functions throughout the twentieth century and into the early-twenty-first. In such neighborhoods, cheap rents and high vacancy rates in storefront occupancy enable the provision of inexpensive goods to those whose budgets constrict their choices. The same interstice of factors offers opportunities for marginal entrepreneurship and a shot at mobility to those who might otherwise fall outside of the economy. The low profit-margins inherent to such entrepreneurship, however, can make for dubious goods and equally dubious practices. Thus, shopping in the Women’s Market calls for a taste for sharp-tongued banter and a quick eye ever on the lookout for rigged scales and for good looking produce on display but underweight and damaged goods placed in one’s shopping bag. Still, where else can one buy, for example, persimmons or grapes, albeit on the last legs of their shelf-lives, for a third of the price of elsewhere and serviceable tomatoes for even less? There is a fine ethnic division of work and functions at the Women’s Market. Meat, cheese, and fish kiosks, and stands offering wild herbs and mushrooms, are run by Bulgarians. Fruit and vegetable stands and peripatetic bootleg cigarette operations are run by Roma (Gypsies). Storefronts in adjacent streets include honey and bee keeping supply stores run by Bulgarians and rows of “Arab” shops — halal butchers, spice stores, barbers, and low-cost international telephone services — run by and catering to increasing numbers of legal and illegal immigrants from Syria, Iraq, Palestine, Turkey, Central Asia, and Afghanistan. 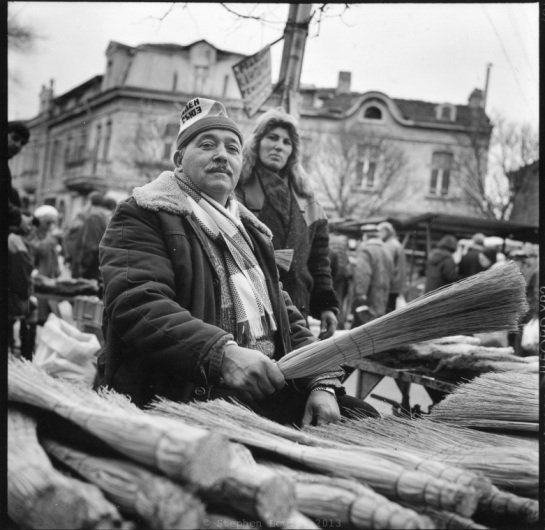 Many Bulgarians, their weak self esteem shakily bolstered by contempt for “others,” blame the shoddier commercial practices of this wonderfully vibrant marginal neighborhood on the presence and “inferiority” of such outsiders. Yet cities, perhaps alone among human institutions, invite and thrive on human diversity. What hope I have for our species I get more from living in cities than from being anywhere else, no matter how pleasant. Steve’s photos and essays don’t always give me more hope, but they always give me more understanding, which is the better deal. An Archway in Tarlebaşı, Istanbul: Orientalism in the Orient, a Statement of Occidental Identity?